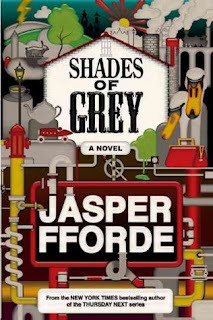 Shades of Grey by Jasper Fforde. Penguin Group Viking Adult, 2009. Hardcover. 400 pages. After many, many years of this book sitting on my shelves, I finally picked it up... and immediately found myself enamored with this book. The only other book I've read by Jasper Fforde is The Eyre Affair, which was also a lot of fun and incredibly well-written. Shades of Grey, in my opinion, was even better. The best part about Shades of Grey is simply the world itself. Fforde has used so much detail that it's almost hard for me to focus on the story because I'm so impressed by the everyday aspects of the world he has created. In Shades of Grey, being able to see different colors to their fullest extent is not a natural ability. For the inhabitants of this world, the higher on the color spectrum you can see of a specific color, the higher your social standing is as well. This book throws you right into the story with no training wheels, so I was a little lost in the first chapter or two, but eventually you will learn to catch on. There are some references and comments that I never fully understand, but I'm not sure if we are meant to anyway. In addition to the fantastic world and overarching ideas presented in this book, there are an abundance of fantastic, wholly unique characters. We have Eddie, our protagonist, his father, a woman named Jane, and an entire cast of fellow town inhabitants that bring so much color (pardon the pun) to this world. Almost everyone has ulterior motives, some harmless and some fairly harmful. I was particularly drawn to the depiction of Eddie's character due to his rather calm, but incredibly relatable nature. He is such a sharp thinker (as are most of these characters, if we're being honest), but also finds himself puzzled by some of the odd behaviour of those around him. At the same time, he's pretty good at accepting that certain figures are just who they are and continuing on with his life. "Eddie's world wasn't always like this. There's evidence of a never-discussed disaster and now, many years later, technology is poor, news sporadic, the notion of change abhorrent, and nighttime is terrifying: no one can see in the dark. Everyone abides by a bizarre regime of rules and regulations, a system of merits and demerits, where punishment can result in permanent expulsion. Eddie, who works for the Color Control Agency, might well have lived out his rose-tinted life without a hitch. But that changes when he becomes smitten with Jane, a Grey, which is low-caste in this color-centric world. She shows Eddie that all is not well with the world he thinks is just and good. Together, they engage in dangerous revolutionary talk." This book goes much deeper than you might expect--it was far deeper than I expected, anyway. I loved the different ideas that Fforde played with, all of which really worked well to make me stop and think. The ending itself has a lot of information, and I'm still not sure if I have completely figured everything out, but that only makes it more entertaining in my personal opinion. Overall, I've given Shades of Grey five stars! I truly enjoyed this book and sincerely hope that Fforde will continue the series sometime! Thanks for reminding me about this one! I've been meaning to read it for forever, but it's definitely been off my radar. Maybe I'll get to it in 2018.